South Sudan's President Salva Kiir, shown here after meeting with Sudan's President Omar al-Bashir in Juba in January, has restored 6 government ministries. 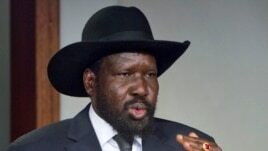 JUBAandnbsp;— South Sudanese President Salva Kiir has restored six government ministries,andnbsp;bringing the number closer to the 29 that existed eight months ago when he fired his entire cabinet and streamlined the government in a sweeping reshuffle. In a presidential order read on state television, Kiir announced the restoration or creation of ministries of Veterans Affairs; Trade, Industry and Investment; Labor; Tourism and Wildlife Conservation; Livestock and Fisheries, and Humanitarian Affairs and Disaster Management. No one has been named yet to head any of the new ministries. Foreign Affairs Ministry spokesman, Mawien Makol Arik, said the ministries would be formed by merging departments from already existing ministries. 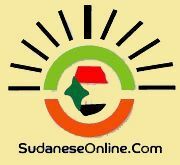 Representatives from other political parties besides the ruling Sudan People's Liberation Movement (SPLM) will be part of the new government, which aims to be more inclusive, Makol said. “There is a need for a national inclusive government, an inclusive government where the other parties can also participate," he said. Makol noted that when Kiir shrank the government in late July, South Sudan was still recovering from austerity measures imposed on the young country during a dispute with Sudan over oil transport fees. Landlocked but oil-rich South Sudan shut down oil production -- a key source of revenue for the south and north -- in January of 2012 amid a dispute with Khartoum over fees to transport crude for export via pipelines controlled by Sudan. But the two neighbors struck an agreement in March last year under which Juba pledged to resume pumping oil and Khartoum to transport and process crude from the south. Since oil production resumed, Makol said the government has sufficient revenues to pay for more ministries. But that would appear to contradict what South Sudan Finance Minister Aggrey Tisa Sabuni said in November -- that the government did notandnbsp; have enough money to pay many of its civil servants as it was trying to pay back $5 billion in unfavorable loans it took on while oil production was shut down for more than a year. In addition, commodities markets news serviceandnbsp;Plattsandnbsp;reported last week that South Sudan's crude exports are expected to drop by around 17 percent next month to 133,333 barrels per day compared to this month, when the country was exporting around 160,000 barrels per day. The projected fall has been blamed on the fighting that is still continuing in the two oil-producing states of Upper Nile and Unity, Platts said.